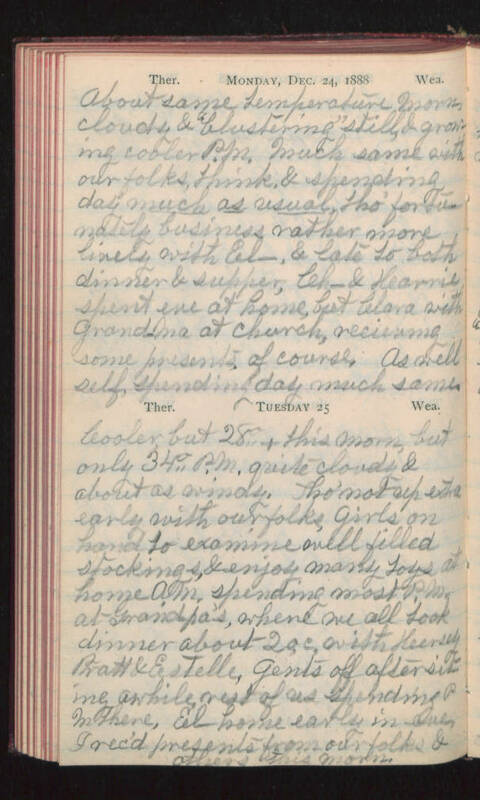 Monday, Dec. 24, 1888 About same temperature morn, cloudy & "blustering" still, & growing cooler P.M. Much same with our folks, think, & spending day much as usual tho' fortunately business rather more lively with El-, & late to both dinner & supper, Ch- & Karrie spent eve at home, but Clara with grandma at church, receiving some presents, of course. As well self, spending day much same. Tuesday 25 Cooler but 28°+ this morn, but only 34° P.M. quite cloudy & about as windy. Tho' not up extra early with our folks, girls on hand to examine well filled stockings, & enjoy many toys at home A.M. spending most P.M. at Grandpa's, where we all took dinner about 2 o.c. with Hersey Pratt & Estelle, gents off after sitting awhile rest of us spending P.M. there, El- home early in eve, I rec'd presents from our folks & others this morn.